Our first full day in Yosemite Valley brought with it the disappointment of overcast skies and low-hanging clouds, which had the unexpected benefit of creating an almost mystical appearance to some of the park’s most iconic rock formations, including El Capitan, Sentinel Rock and Half Dome. However, a quick hike near Bridalveil Fall and Cathedral Rock didn’t disappoint. At just 617 feet, Bridalveil Fall is not the world’s highest (in fact, 430 falls throughout the world are higher), but with millions of people viewing it each year, it is, arguably, one of the most well-known waterfalls anywhere on Earth. According to native Ahwahneechee legend, the spirit Pohono (a name that means Puffing Wind) lived in the fall and guarded the entrance to Yosemite Valley. Anyone who dared look directly into the fall upon leaving the valley would be cursed. Not wanting to expose ourselves to such a fate, we did all of our fall gazing upon arrival, taking tons of photos along the way. Water has played a significant role in the development of Yosemite for eons. 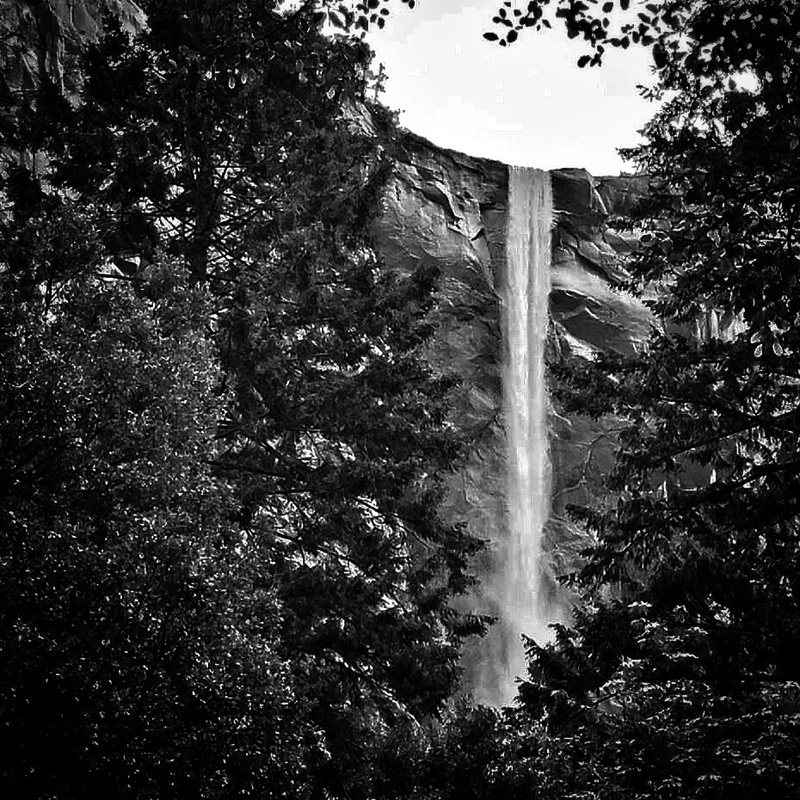 Standing at the foot of Bridalveil Fall made clear the power of water to transform even the toughest of stone. Seeing the fall surrounded by majestic pines and soaring rock formations defied adequate description. So we’re counting on the pictures we took (album to come) to convey thousands of words.